Can Hilal retain their title? After a 40-day break, WBPL matches and Palestine Cup matches came thick and fast in April with games being played at a rate of one every four days. The break served some sides better than others. When former national team manager Julio Baldivieso summoned players to camp there was a four horse race for the title with Ahli Al-Khaleel (32 points) leading the charge followed closely by Hilal Al-Quds (30 points with a game in hand), Shabab Al-Khaleel (29 points), and upstarts Jabal Al-Mukaber (28 points) were all very much in the title race. Five match days have radically altered the picture. 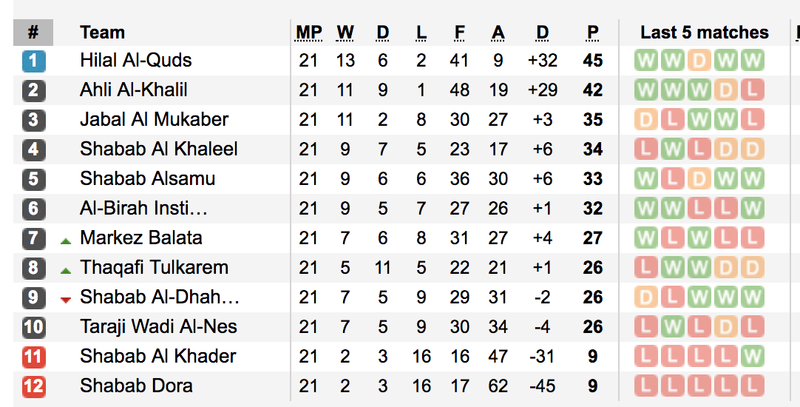 Jabal Al-Mukaber promptly bowed out of the title race by losing to relegation fodder Shabab Al-Khader 2-1 and while they recovered to win their next two games, a 2-0 loss to Hilal Al-Quds in the Jerusalem derby last week sealed their fate. 2016 Champions Shabab Al-Khaleel emerged from the 40 day hibernation period still asleep winning just one of their final five matches. They did manage to leave their fingerprints on the race however by holding crosstown rivals Ahli Al-Khaleel to a 0-0 draw. With just this weekend's matches remaining Hilal Al-Quds and Ahli Al-Khaleel can lift the title. The latter will be ruing the international break that left them without half their starting backline. Musab Al-Battat was felled by injury while Mohammed Saleh was prevented from entering the West Bank for 10 days by Israel's occupying forces. A 5-4 loss to Shabab Al-Sam'u exposed the side's lack of depth- especially in defence. To make matters worse the Reds fell to title rivals Hilal Al-Quds 3-2 in the semifinals of the Palestine Cup ending their hopes at a fourth consecutive title. Shabab Al-Sam'u would go on to further influence the title race becoming the only team to avoid defeat vs Hilal Al-Quds this month a 1-1 draw. That result leaves the narrowest of windows for Ahli Al-Khalil who will need to take care of business vs. Al-Birah and hope Shabab Al-Dhahrieh can beat Hilal Al-Quds. Ahli Al-Khaleel have the tie breaker between the two sides having collected a 0-0 draw and a 1-0 win against the side from the capital. Should Hilal Al-Quds get the result they need this weekend, they will become the first WBPL side to successfully defend their league title. They can also set a mark for fewest goals conceded in a league season if they manage a clean sheet. 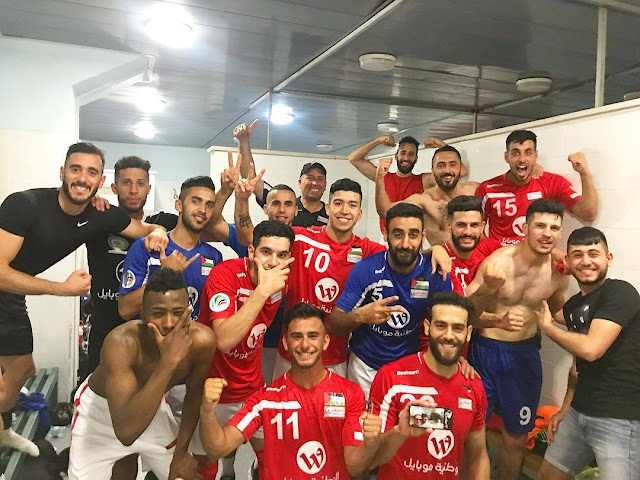 Ahli Al-Khaleel could also set a new mark in a losing effort, a single goal could see them set a new mark for most goals scored in a WBPL season. The league's current top scorer- Ahli Al-Khaleel's Khaldoun Al-Halman- is also one away from setting a single season record for goals scored (20). Regardless of who emerges as the eventual victor, followers of the league should be optimistic about the direction of the fledgeling league. Both Ahli and Hilal would be worthy winners and there has been competent play amongst most teams (relegated teams excepted).